Strange, Santa Muerte in the Philippines? For personal reasons, I’m not disclosing the town where this image is found and will edit the name out if I find it in the comments. This is part of my Semana Santa series where I feature rituals and traditions observed in certain places during this solemn week in the Catholic calendar. Click on the image at the right to check the rest of the articles. Detail of the head, sans some teeth. CLICK TO ENLARGE. The first time I heard about it, I was dumbfounded that I just have to go and peek. No, take pictures and see for myself, one of the country’s rarest images in the lenten procession. What’s more, its antique and have the head and hands made of ivory. 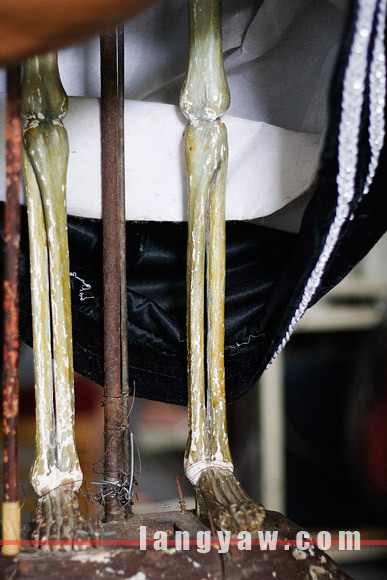 The Santa Muerte is a popular cult in Mexico with a growing number of devotees. Even Time and the National Geographic magazine covered this phenomenon. In the country, death has always been a part of Catholicism and syncretic versions of it but as part of the lenten procession? It’s quite rare. I’ve seen an old picture of a procession in Calasiao, Pangasinan where a man was holding an effigy of death. A friend also mentioned that he saw in one of the Luzon towns Death sitting on top of a globe during lent. The one in the Visayas is part of the lenten ensemble ordered by a parish priest in the 19th century, all having a head and pair of hands made from ivory standing around 4 feet in height. These images were distributed to the various prominent families of that time as caretakers. Currently, one family sold theirs and according to some townsfolk, its the reason why they are having a string of bad luck. I was also told by the caretaker of the La Muerte image that in the Philippines, Iloilo had the other one but was sold to a collector leaving this the only one in a lenten paso. I visited the house of the caretaker and inspected the image where it was put, robed, crowned and standing regal. The image’s head of ivory is just stunning. The details, the cranium’s sutures but with some teeth remaining. The individual bones of the hands are just gorgeous. Underneath the velvety robe is a skeleton made from wood. Truly, one of a kind piece that should remain in that town. wtf! san ito? curious pre! This is my first time reading about skeleton or an effigy of death. Yes I have seen this since my family are from that town. I was scared before. I never thought it was ivory! kelan yung event na toh? i hope i can go to this event. 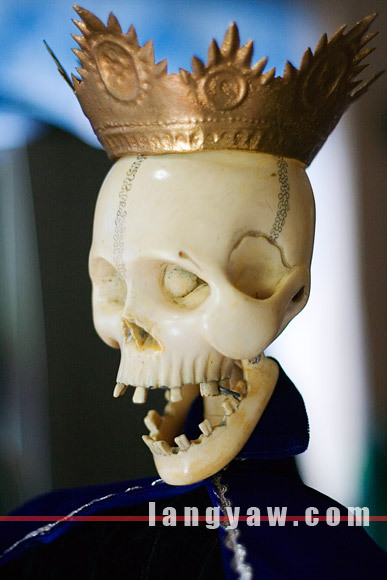 and im hoping to get one of those santa muerte ..
Im drop jaw …truly rare item more power! Hi Estan, I am making a new book… a Survey of Holy Week Processions in the Philippines…. I would like to ask you to join the project… i hope we could meet and discuss further the project… you can contact me at [email protected]. I hope any burned bridges for the mis communication in 2009 would have been buried under the hatchet. Your kin eye for details and personal approach suits our anthropological and sociological attack on Lenten celebration here in the Philippines.